It’s Tuesday again! Woohoo! I am actually very excited because tomorrow is Wednesday and on Wednesday I will be working on something I am super excited about! Expect results soon!!! But you didn’t come here for cryptic messages about big plans, and things that excite me…you came here because it’s time for Tuesday Top 5! So here goes! 1. Babysitting my nephew. On Friday, I was left with a big responsibility. Pick up my nephew from school (it was a half-day) and babysit him till around 5:00pm. Now, I babysit my nephew all the time. But pick up from school? Oh man, that part sounded scary. That’s what moms do! You gotta drive all extra safe. You can’t forget him and accidentally leave him there (once someone forgot me at school and it SUCKED). But all went smoothly. I was like the best aunt ever. Picked him up on time. Took him to Victor Jr.’s for a little pizza pie lunch! Took him to the playground and got him a popsicle. Please file me under Best Aunt Ever! Seriously, it was awesome. And I had a blast with my favorite li’l guy all day. Because my nephew is HILARIOUS and ADORABLE!! 2. Watching Kids Perform! This week was like my kids week. You see my friend Brooklyn directs a kids musical theater program and I went to see their final performance of Annie. Then the next day, I saw my niece perform in her spring school recital, which also was a musical theater theme. It kinda warms my heart to see the kids get up there and give it their all. When I was a kid I was in like a gazillion musicals. I loved seeing a full house and watching people clap & cheer for me (and you know the whole cast)! It gave me so much confidence. And so going to these shows is kinda a full circle, giving back thing. And it gives me the warm & fuzzies. 4. Mother’s Day. Lots of people asked me what I did for mother’s day. Well, I spent it with my momma. At Dim Sum. All day. Because we waited for two hours to get a table. Because apparently that place took reservations and we didn’t know. So two hours of sitting & waiting & hunger. BUT when we got to eat finally it was delicious!!! Plus I got to be with my mom and laugh and just be. And that was nice. On a sad note, it was really hard not having dinner with my grandma or buying her a card. Mother’s Day was like superrr important to her…so to not be doing anything with her was just strange. 5. Spring Weather. Okay well minus the days it has been really windy, it is finally starting to get all springy & warm! The Jacaranda trees are in bloom which I love! And the sun feels so good! It just makes me excited! I can tell summer is around the corner and that means swimming and bbqs and fun! Love it! 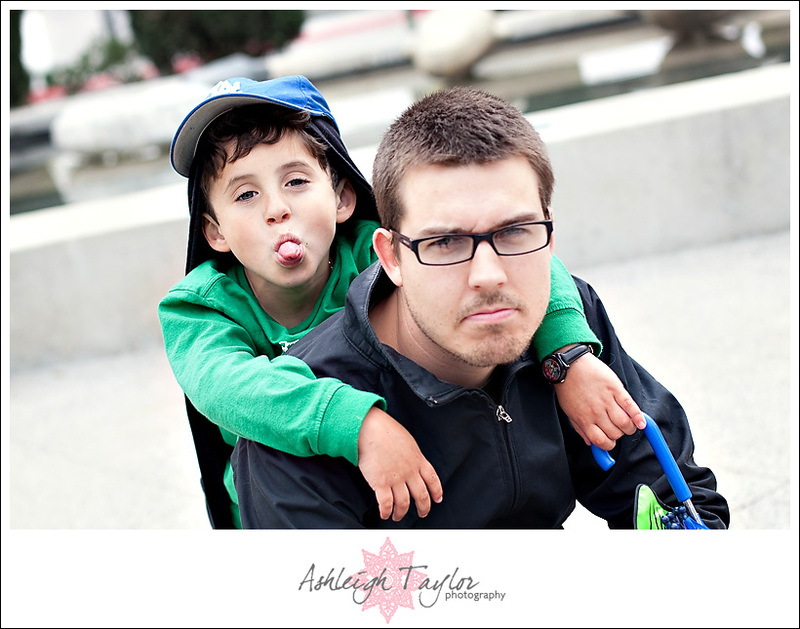 I will leave you with a quick picture I snapped of AJ & my nephew, Leo, back in February. I never posted it because its not a perfect shot. AJ is a little out of focus. But I dunno I kinda love this shot. Despite AJ being out of focus. So there. christina - Yay! I am so glad you remembered your nephew. Phew…that could of been very bad. I love the imperfect picture. That’s what life’s about, right? Imperfections, but the great part is… if you look past the bad, there is so much good to be seen, like your nephews Dodger hat. :)Great post!